With her elaborate, mostly textile works, Nina Braun offers the viewer a highly tactile experience and the possibility to get into it fast by using simple forms, iconic characters and ironic humorous storytelling. Through closer inspection the viewer might discover what stands beneath the friendly surface: social research and criticism, psychodrama, tragedy and joy of life. Moving her focus even more towards sculpting over the past years, Nina takes the liberty to explore different materials and processes. 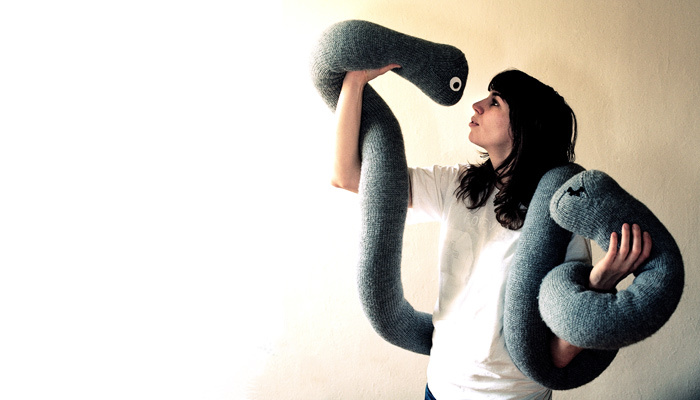 She produces sculptures, installations, textile pictures, objects and cartoons. Born in 1974 in Quartu San Elena / Italy. Lives and works in Berlin. Studied Visual Arts at Hochschule fuer Bildende Kuenste, Hamburg / Germany, but left the academy before the exams for the benefit of her girl‘s skateboarding company Sumo she ran back then. Nina would like to thank Margo Braun (knitting support), Felix Gebhard (photography & love), Bobbie & Elmo (inspiration), Clara Bahlsen (photography), Judith Holofernes (collaboration on the book project), Anneli Schütz (help), Frauke Buchholz (assistance), Michael Kraft (photography), Marton Dobozi (first aid webstuff), Miri Moritz (supervision), Bergère de France (wool) and Cleptomanicx for supporting her!